Nurassyl Battalgazy was born in north of Kazakhstan, in city Taraz in 1993. In 2012 he graduated Kazakh-Turkish high school for gifted boys. 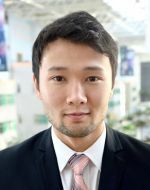 After that he entered Nazarbayev University and graduated in 2017 with bachelor’s degree in Civil Engineering. In the same year, started master’s degree at School of Mining and Geosciences in Nazarbayev University and currently doing research on topics related to geostatistics. Won several championships in boxing at Nazarbayev University. In a mining project, all the downstream activities including mine production planning and pit design dependent on the predicted mineral resource quantity inside the block model produced by interpolation methodologies. For instance, mine optimization by Net Present Value (NPV) is highly impacted if the constructed block model is not able to reflect the reliable distribution of the variable of interest which, therefore, some negative consequences might happen. Geostatistical algorithms such as kriging and simulation have received wide acceptance among the practitioners because of versatility. However, kriging methods suffer from smoothing effect, while the simulation approaches turn out exactly the original variability, in which the uncertainty can also be quantified. In multi-element deposits wherein there exists a good correlation between the variables, the co-simulation approaches are motivated to be employed to reproduce that intrinsic interrelationship. This study shows that how those co-simulation techniques can be applied in the process of further mine optimisation and production planning processes.